My Journey Into Android Apps. 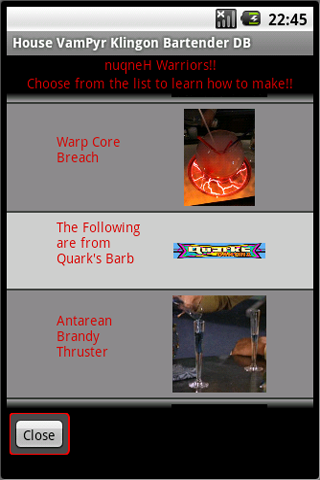 House VamPyr and Random Android Apps presents the Klingon Bartender Guide. Listed are drinks from around the universe. We ask that if you make any of the drinks to please email a picture of them to us. 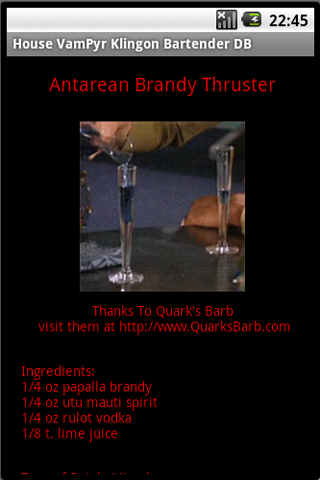 May Kahless grant you great glory in your bartending!! This entry was posted on Monday, February 7th, 2011 at 3:45 am	and is filed under Uncategorized. You can follow any responses to this entry through the RSS 2.0 feed. You can leave a response, or trackback from your own site. Random Android Apps is proudly powered by WordPress and The Go Green Blog theme.